BEIJING, January 10. /TASS/. 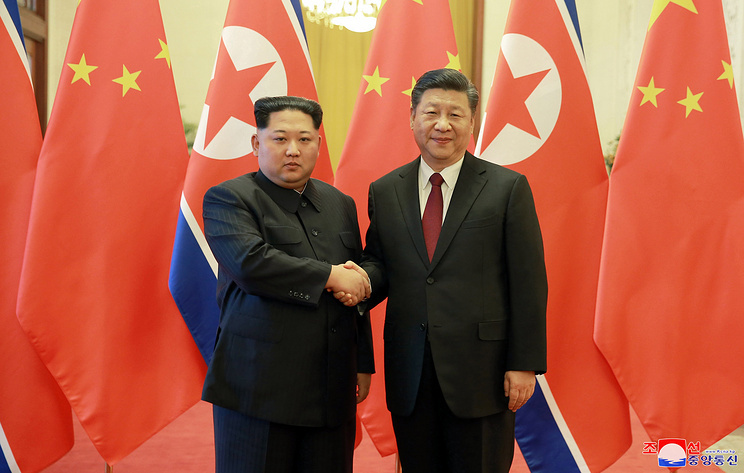 Chinese President Xi Jinping said at the meeting with North Korean leader Kim Jong Un that China is ready to actively facilitate the process of nuclear denuclearization on the Korean Peninsula, Xinhua reported on Thursday. “It is in our interests to act in the same direction with you, uniting efforts with other interested parties. To ensure peace and security, we will facilitate denuclearization and play a constructive role in maintaining long-term peace in the region,” Xi said. Meanwhile, North Korean leader Kim Jong Un expressed hope that interested parties will provide assistance in the process of denuclearlization on the Korean Peninsula. Xinhua said. “I hope that interested parties will pay close attention and actively support DPRK [Democratic People’s Republic of Korea], will take into account our concerns and will unite efforts for comprehensive settlement of the problem of denuclearization on the Korean Peninsula,” Kim Jong Un said adding that North Korea will consistently pursue nuclear disarmament exclusively through peaceful dialogue. On January 7 North Korean leader Kim Jong Un made an official visit to Beijing where he held talks with Chinese President Xi Jinping. The visit came ahead of the possible second summit between Kim Jong Un and US President Donald Trump. Hey Buddy!, I found this information for you: "China will facilitate denuclearization on Korean Peninsula — president". Here is the website link: https://russophile.org/china-will-facilitate-denuclearization-on-korean-peninsula-president/. Thank you.